Hudson Valley uses only the Margret (breast) to make their Duck Bacon. After curing in a brine with a blend of propietary spices, the meat is smoked lovingly for hours to achieve the classic bacon flavor. Crisp in pan or oven to use anywhere bacon is appropriate. Product is fully cooked ready to heat and eat. Keeps for 12 weeks in packaging. Duck Bacon There are 3 products. 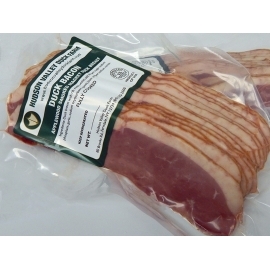 Applewood Duck Bacon - 16 oz. 2 packages at 8 oz. each. 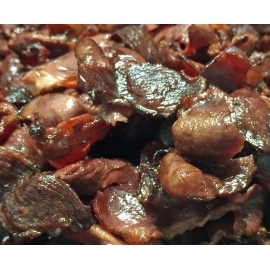 Applewood Duck Bacon - 5lbs. Single package of 5 lbs.